I would like to share this quilt with you. I made this for my granddaughter. I just love it. It was a quilting journey for me as I made it up as I went along. I did try to use a graph book to plan the placement of the block. It is nice when I go to my daughters place and see the quilt is being used everyday. I made her brother quilt for his birthday and the day I gave it to him. She said where's mine so that is how it got it's name. 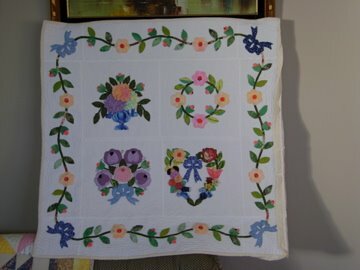 LOVE it LOVE it LOVE it LOVE it LOVE it - this is exactly the kind of quilt I really really love - whimsical, different, interesting, pretty too and you can see that it was made by someone for a loved one - there's real heart in it. I would love to make something as special as this one day. 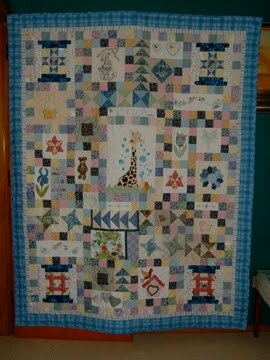 Wonderfull quilt and a wonderfull gift to your granddaughter! Lucky granddaughter. I'm glad she's enjoying it and that you enjoyed making it. It's beautiful and I love the giraffe in the middle! What a wonderful quilt! You DGD is a lucky girl to have such a talented DGM. I really like all your quilts. Look forward to seeing the extension done and your next project. Love the name! It made me smile...thanks for sharing it with us! great and the story is a fun one!! Me too...LOVE IT! It is gorgeous! Oh! This is so beautiful! I love all the different sections! It was well worth the wait! I hope that I can have my unfinished ones ready for when we have future grandbabies! (the initial deadlines have come and gone for the ones I have had unfinished!) This quilt festival has inspired me to get to working on them again. I am a novice quilter and have only done hand quilting...I look forward to try and do some free motion quilting. If you have a moment to come over, please let me know by leaving a comment at my post. It was fun meeting you! Love your quilt. It's so wonderfully whimsical. What lucky grandchildren! That is one of the best gifts...made with so much love.